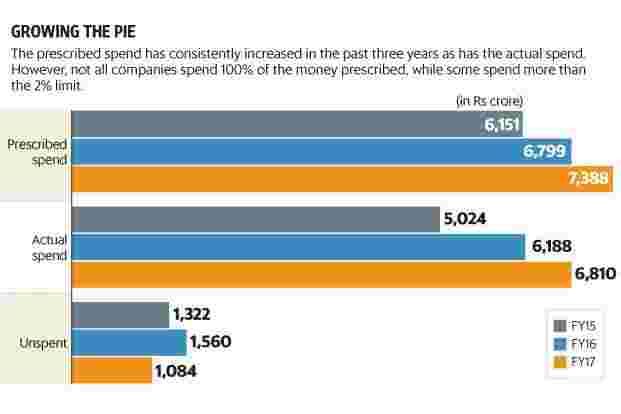 At Rs3,307 crore, the share of the top 10 companies was once again nearly 50% of the total amount spent by the firms surveyed. “The overall CSR spend growth has reduced to 10% this fiscal from 23% in the previous. This is primarily due to two reasons: the overall rate of growth of companies’ profits has slowed down in this fiscal year and second, 16% of companies have reduced their overall spend, though their profits have grown, causing an overall slowdown of CSR spend in the ecosystem," says Abhishek Humbad, founder and co-chief executive officer (CEO) of Goodera. “In FY17, spend by PSUs has decreased by 9%, though the prescribed spend grew by 1%. This is mainly due to certain PSUs being non-compliant since the law came into existence. Some of the common explanations cited for non-compliance are multi-year projects, delay in identification of projects and other related delays," says Humbad. One of the ways to improve the current situation is to invest in fewer but strategic projects instead of taking up more projects. 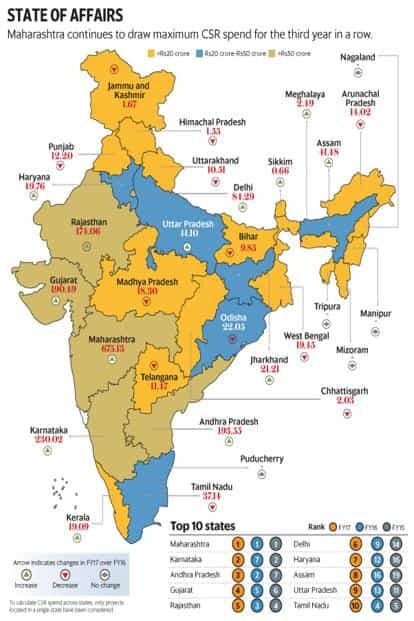 “On an average, while private companies take up 14 projects, the corresponding number for PSUs is 26, which leads to thinning of resources and lack of adequate focus on projects under PSUs," he adds. As in the previous two years, in FY17, nearly half of the top 10 spenders exceeded their prescribed limit. Perhaps one approach could be like that of NTPC Ltd, which ranks at No. 6 in the spend tally. The company reported that almost half of its CSR budget was allocated to hunger, healthcare and poverty alleviation projects. NTPC also takes up most of the CSR activities primarily in the neighbourhood villages of its units too. “Despite the slowdown in the growth rate of the economy, India is still one of the fastest-growing economies in the world. This growth has been accompanied by certain aberrations like social and economic inequity, lagging human development indicators, environmental degradation, etc. Therefore NTPC’s endeavours for sustainable socio-economic development," says G. Sridhar, additional general manager (CSR) at NTPC. As in the previous two years, in FY17, nearly half of the top 10 spenders exceeded their prescribed limit. Tata Steel Ltd, ranked at No. 9, led the tally with a spending of almost 67% above its prescribed limit. “We do not look at 2% as a cut-off limit. The onus is on us to do more nuanced and high-impact activities to bring in social change. This is built into the DNA of our company," says Biren Ramesh Bhuta, chief CSR officer at Tata Steel. He believes that more and more companies in India are now incorporating sustainability practices and carrying out effective CSR practices because that is the need of the day. “There are two compelling reasons: If you as a business want to survive for 100 years, you have to do right by the society you work in and if you want to grow, you cannot do so by leaving a large section of the society so behind," he adds. ITC Ltd, ranked as the seventh largest spender with spends in six of the 11 activities of Schedule VII, including the oft neglected national heritage, says it focuses on activities that meet the developmental needs of its stakeholder communities. “ITC’s CSR interventions are focused on two stakeholder communities: rural communities with whom ITC’s agri-businesses have forged enduring partnerships through crop development and procurement activities; and communities residing in close proximity to our production units," says Ashesh Ambasta, executive vice-president and head (social investments) at ITC. HDFC Bank Ltd has been looking to scale up its CSR strategy. Ranked four on the spend tally, for the first time in three years of reporting the bank has a 100% actual spend (Rs305.42 crore) versus the prescribed spend. “We have consciously tried to ensure that we have a broad spread. We operate in about 18 states and while we have been increasing our footprint, there is a certain method in how we pick the specific areas that we work in," says Paresh Sukthankar, deputy managing director at HDFC Bank. “In the first year, we covered about 60-65 villages. Many of these villages had been allocated to us to open accounts under the Jan Dhan Yojana, and we thought that while we address their basic financial inclusion and banking needs, why not also do an overall needs assessment and deal with their other developmental issues too? By March 2017, we had covered 560 villages under this Holistic Rural Development Programme (HRDP) and many more villages under smaller projects. Today we are working in over 750 villages under HRDP," he says. The bank spent about 41.6% of its CSR spend under rural development category according to its annual report. “The higher level of spends has come from scaling up of some of the initiatives in the areas that we have been previously working in. We have always worked in education, skilling, sanitation and financial inclusion, and our initiative and outlays in these areas have grown. We have also got our toes wet in a few newer areas although the absolute outlays in some of these will be smaller," adds Sukthankar. Meanwhile, Ambasta says ITC, out of its total spend of Rs275.96 crore, spent Rs2.18 crore on conservation of heritage, art and culture through the ITC Sangeet Research Academy. “Exceptionally gifted students, carefully handpicked across India, receive full scholarships to reside and pursue their music education at the academy campus," he explains. Infosys, which ranks fifth in the top 10 spenders list, is also the only company to show CSR spend under the Armed Forces veterans category of Schedule VII. Infosys, which ranks fifth in the top 10 spenders list, is also the only company to show CSR spend under the Armed Forces veterans category of Schedule VII. The Infosys Foundation gives aid to disabled veterans and to around 194 families of Central Armed Police Forces martyrs. 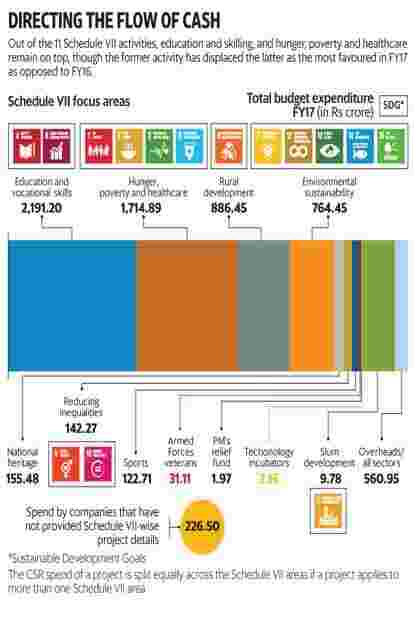 “This will be a multi-year activity for the foundation," says Sudha Murty, chairperson of Infosys Foundation, who is also pleased to note that spending for CSR has gone up overall, with the company spending a little above its prescribed limit this year. “From the perspective of Infosys Foundation we were glad to see the approved increase in spend, due to which we were able to commit and utilize funding for deserving multi-year projects and extend our reach to more states," adds Murty. The top spender, Reliance Industries Ltd, has held on to the position for the third year in a row and as in the previous years, has spent above its prescribed spend. “Reliance Foundation (which implements CSR projects for the company) is focused on addressing the nation’s development challenges in areas of rural transformation, education, health, sports for development and more," says Jagannatha Kumar, CEO of Reliance Foundation. The company, which has spent 77.7% of its CSR funding on projects related to education, sanitation, skill development, etc., has also reported a Rs26.8 crore spending on the development of sports. Nita M. Ambani, founder and chairperson of Reliance Foundation who is also a member of the International Olympic Committee, is seen as the reason behind the push to include sports in the foundation’s work. “RIL believes in the power of sports to create positive social impact and is committed to creating a large-scale ecosystem for sports and to train the youth of India to take it up as a vocation," adds Kumar. Among the Schedule VII activities that received the lowest funding were Prime Minister’s relief fund and technology incubators. “We will have to take it that it is a reflection of the need in the society. The priorities of the community needs is reflected in the CSR expenditures," explains Santhosh Jayaram, partner and head (sustainability and CSR advisory) at KPMG. The general consensus among industry experts is that in the third year, companies are moving beyond compliance to focus on creating a long-term impact for the beneficiaries. “The MCA (ministry of corporate affairs) guidelines mandate companies to report on their CSR spend. However, we are seeing that many companies are proactively conducting extensive monitoring and evaluation, and impact assessment for their projects and reporting these through CSR specific detailed reports," says Humbad of Goodera. So some things have changed from FY15 and FY16. “The first two years there was struggle to get clarity on how existing work should be aligned to CSR and how initiatives have to be taken that are in conformity to the CSR schedule. In the third year, we found an improvement in quality of proposals that are being developed and an increased interest to develop flagship programmes that will give the companies greater visibility," says Niraj Seth, executive director (advisory services) at EY India. This is reflected not just in how the private sector is engaging with CSR but PSUs too. “During the last three years, many structural as well as procedural interventions have been taken to strengthen the CSR process of the corporation. IndianOil has framed a CSR Policy and Guidelines to streamline the execution, monitoring, evaluation and impact assessment of activities. Now, most of our CSR activities are being executed in project mode. Also, CSR officials have been posted in 31 key establishments and unit-level CSR panels have been constituted to conceive, implement and monitor CSR projects," says Kali Krishna, chief general manager (corporate communications) at Indian Oil Corp. Ltd.
Jayaram of KPMG adds that now the thought process is going beyond spend allocation. “We see more detailed discussion around impact and very structured process for monitoring and evaluation." Besides wanting to include impact assessment and in some cases doing so, experts and companies shared some more learnings from doing CSR for three years. “This is our third year of CSR learning: While working in a specific geography, even though we may have started with one project or one specific activity, when we identified other areas of intervention that could make things better for the community, we saw value in a more holistic approach," says Sukthankar of HDFC Bank. Among the Schedule VII activities that received the lowest funding were Prime Minister’s relief fund and technology incubators. For Infosys Foundation, the focus was on processes and governance. “These have been tightened. Third-party impact assessment has been introduced and is periodically reviewed for improvement. Reach has been expanded to other states where Infosys Foundation does not have a presence," says Murty. This year, more than before, Ambasta of ITC believes organizations have figured out the nuances of the CSR Rules. “After a slow start, companies have set their CSR policy, focus areas and implementation mechanism in place. Most companies over the last three years are bound to have increased their CSR spends till they at least touch the 2% target. This has and will positively impact as well as address the developmental challenges that our country faces, including reduction in inequality." Haris Zargar contributed to this story.